Alina Paul-Bossuet is a communications specialist with TCi partner organization ICRISAT, where she engages in range of agricultural development issues and topics around India. Here, she contributes a guest post about India’s recently passed, much debated, Food Security Bill. India urgently needs serious investment in nutrition to give children a chance for healthy development. With the bill, an estimated 800 million people (75 percent of rural and 50 percent of urban population) are entitled to wheat, rice and millet at Rs 3, Rs 2 and Rs 1 per kg. This scheme hopes to tackle alarming rates of child under-nutrition in India where 60 million (almost half of the child population) are underweight. India has seen strong economic growth in the last two decades, yet paradoxically child malnutrition continues to be among the highest in the world. Along with this new bill, we need to consider a more holistic approach in order to make a real impact. The poor nutrition of women before and during pregnancy needs to be tackled as well as the care and feeding of children if we want to give children a better start in life and support mothers to nourish themselves and the next generation. What will the new bill offer these mothers? Providing calories through increased wheat and rice consumption is not enough. Essential micronutrients like iron (to fight anemia which affects up to 75 percent of women in India) and protein-rich pulses must be consumed in tandem with calorie dense foods. Beyond this, nutrition education is essential; that also means better hygiene and sanitation and access to basic health services. A baby suffering from diarrhea caused by contaminated water will be unable to absorb nutrients from food. Indian mothers are supposed to be reached by health (anganwadi) and social (ASHA) workers, but these critical service providers are overwhelmed, poorly paid and are often ill-equipped and under-trained. States like Tamil Nadu which have improved the pay and status of their community workers have also seen improvements in maternal and child health. When we look at food as part of the holistic system, we need to look at promoting diversification so that traditional nutritious crops like millet can become more popular alongside high protein pulses like chickpea and pigeonpea (up to 25 percent protein). The International Crop Research Institute for the Semi-Arid Tropics (ICRISAT), part of the CGIAR consortium for agricultural research for development, is working with smallholder farmers in Africa and Asia to grow more nutritious, diverse and resilient food. ICRISAT has been working with Tata Trust for more than a decade on rural development programs including water management, and has been promoting nutritious home gardens and small livestock rearing in Jharkhand district. ICRISAT has also been improving soil fertility and increasing the quality and quantity of harvests through a land rejuvenation initiative called Bhoochetana in Karnataka. Through this, farmers have diversified farms and increased yields. Some have had a 66 percent gain in calcium-rich finger millet yields through improved varieties and better soil health. In January, the state of Tamil Nadu not only began including millet in the school midday meal scheme, they also experimented with different recipes to ensure its acceptance. 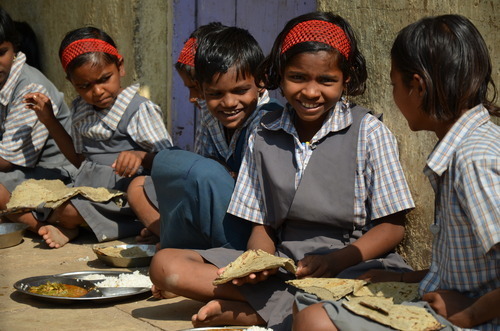 Adding millet to wheat and rice for school meals will hopefully boost its cultivation as well as child nutrition. ICRISAT scientists are working with HarvestPlus on further improving the nutritional content of millet and recent studies have shown that iron and zinc rich pearl millet can meet children’s needs for these vital micronutrients. The new food bill does not currently include high protein pulses due to lack of supply. The Indian government is working with ICRISAT researchers to encourage farmers to grow higher yielding drought tolerant pulses like groundnuts and pigeonpea, which not only provide food from the pods but also fodder for livestock feed from the rest. 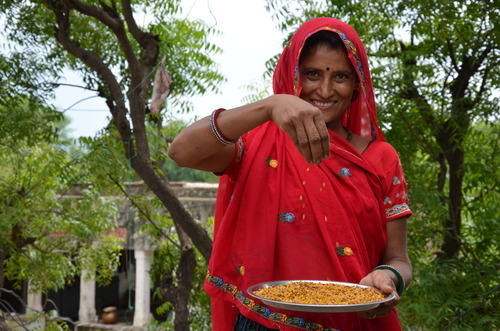 Women farmers in dry regions such as Rajasthan are harvesting up to twice as much pigeonpea crop as well as using the stalks as fuel wood for cooking. Farmers in a similarly dry district, Anantapur in Andhra Pradesh, have found that new groundnut varieties not only give much better yields in dry weather, but have also resulted in increased milk yields from livestock eating the leftover crop after the pods have been harvested. The big question remains: how do we ensure that women and children – those suffering the most from malnutrition – benefit from the food bill and other efforts to improve nutrition? Yes, by making sure that the social, sanitation and health context is improved along with agriculture. But we also need to empower women within this healthier context so that they and their children are better nourished in the long term. Empowerment doesn’t necessarily come with wealth and education. An index launched last year to measure women’s empowerment in agriculture analyzes women’s engagement in agriculture over five areas: production, resources, income, leadership and time allocation. The tool could be expanded to help find ways to increase empowerment and assess the impact that has on nutrition. 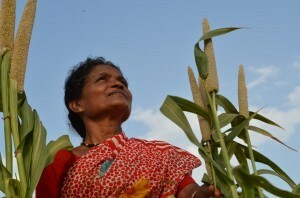 Interested in writing a guest post on India, agriculture and nutrition for TCi? Contact us at tci.cals@cornell.edu.